Before taking up the story of the Red Fort once again, I shall digress a little and tell you what the new fort and city looked like. The fort was an irregular octagon, which means, a building with eight sides. Its two long sides faced the east and the west. The six smaller ones faced the north and the south. The Nakkar Khana, where the royal band played five times a day, became the main gateway of the Diwan- i-Am. All visitors to the court, except those who belonged to royal families, had to get off their horses here and walk the rest of the way. The Djwan-i-Am, built of red stone, was originally covered with shell plaster. It was carefully polished to look like smooth white ivory. The enormous hall measured 80 feet by 40 feet and had many pillars supporting it. The gorgeous carpets, the awnings, the gold and silver railings, which once made this hall look so grand, are no longer there. But the richly carved and inlaid marble platform, where the Emperor once sat in State, still looks as majestic as ever. If you look behind the marble platform carefully you will find some examples of Italian pietra-dura work.. There is one small panel at the top that shows Orpheus fiddling to wild animals. It is said to be the work of someone called Austin Bordeaux. 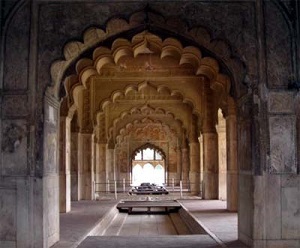 Even more impressive is the Diwan-i-Khas, which measures 90 feet by 16 feet. Fergusson, a famous historian, described this hall as "if not the most beautiful, certainly the most highly ornamented of all Shah Jahan's buildings." The hall once had a ceiling made of silver with flowered patterns. The decorations were made of gold and inlay work. But it was removed by the Marathas when they occupied the Red Fort. That, however, comes much later. The Rang Mahal is yet another building that looks really striking even today. Historians have called it the “Crowning jewel of Shah Jahan's seraglio”. 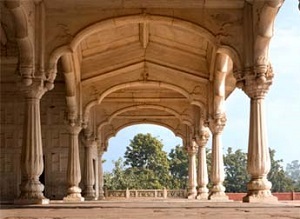 The Rang Mahal, 153 feet by 69 feet has a main Central hall with small compartments at each end. This hall also had a silver ceiling. The walls were a marvel of gilt and color. The eastern wall of the Rang Mahal has five windows overlooking the river. The Emperor’s favorite queens watched the elephant fights on the riverbank from these windows. The most beautiful structure in the hall was the fountain basin at the Centre, made of precious stones and colored marbles. Needless to say, no palace could be considered complete without its share of gardens, fountains and waterways. Two gardens, the Mahtab (the moon) and Hayat Baksh (the life giver) added their share of beauty to the palace. Streams of water flowed through the gardens and also through the halls of the palaces. The man who designed them ensured a constant supply of water from the Yamuna flowing next to the Red Fort in those days. Then there were the two monsoon pavilions, Sawan and Bhadon. They had running water below, lit up with artificial lights. They gave the impression of clouds and rain. A moat, 75 feet wide and 30 feet deep, ran round the walls of the fort. According to Bernier, this moat was always kept filled with water and used to be full of fish during the Mughal times. Pattharghatti Gate and Lahori Gate, though built at the same time as the fort, no longer exist though the names remain. The gates were all closed at night. There were night guards posted at each of the gates. There was also a boat bridge across the river connecting the city to the world outside. It was located exactly where the present railway bridge stands. It took ten long years of nonstop labor to complete the fort. Then, on a bright April day in 1648, the royal procession entered the newly built Seventh City of Delhi. Prince Dara Shikoh, the eldest son of Shah Jahan, showered coins of gold and silver on the Emperor and threw them to the waiting crowd. A new coin was struck to commemorate the building of the new capital. It was named Qila-e-Mualla ( the auspicious fort ) and the new city was named Shahjahanabad, after its builder. "The fabulous Peacock Throne was shaped in the form of two dancing peacocks with their tails fanned out. Each peacock's eyes were a-glitter with rubies and diamonds. Between the tail- spreads of the peacocks was a parakeet, cut out of one large emerald. The massive legs of the throne were studded with diamonds and emeralds. And above the throne was a gold-laced canopy. On either side were two human figures, also made of gold, pearls and other precious stones." Percival, the famous historian, calls it “An expert's description of the Peacock throne”. As you may guess, people came from far and wide to see this marvelous creation. 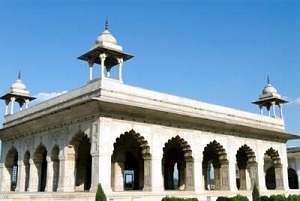 Muhammad Salih, the official historian of Shah Jahan, gives an interesting account of the inauguration ceremony: “The roofs, walls and colonnade of the Diwan-i-Am were hung with brocaded velvet from Turkey and silk from China. Silver columns supported a gorgeous canopy, specially prepared for the occasion in the royal factory at Ahmedabad, while the golden pillars, wreathed with bands of studded gems supported another splendid canopy for the throne. 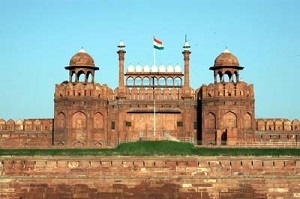 Such was the pomp and glory of the inauguration ceremony of the fort, which has been estimated to have been built at a cost of hundred lakhs of rupees”. “Amid these streets are dispersed the habitations of ...officers of justice, and rich merchants. Very few (of these) are built entirely of brick or stone and several are made only of clay and straw. Yet they are airy and pleasant, most of them having courtyards and gardens, being commodious inside and containing good furniture. " “Zoning”, i.e. dividing a city into zones, was an important part of town planning in those days. The division was made according to occupation and social groups. So the new city had Baidwara, Daiwara, Naiwara, Dhobiwara, maliwara (i.e., quarters of doctors, midwives, barbers, washermen, gardeners) and so on. There were also separate wings called katras for each class of tradesmen and guilds of craftsmen. Then there were chowks, or rectangular open spaces, where people met one another. It was a place of relaxation for men and children. Women were also allowed to meet there at certain times when there would be no men around. There was a raised piece of land known as Bhojla Pahar facing the southern gate of the fort. That is where Shah Jahan decided to build the royal mosque. He called it the Jami Masjid . It is the largest mosque in India. There is an interesting story about the laying of the foundation stone. 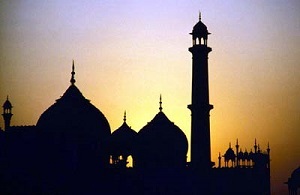 The day the foundation of the mosque was laid - October 6, 1650 - the Emperor addressed the nobles, maulavis and people who had gathered, and said that the laying of the foundation stone was a very special privilege. He added that he would allow the person who had never missed his midnight prayer to date, or the first takbir in a congregation prayer, to lay the foundation stone, whoever he might be. He could be a commoner or someone from royalty. It did not matter. Unfortunately there was no one present, including the Emperor himself, who could claim such regularity! Not even any of the priests present had been that regular either. So, the foundation stone was eventually laid by Shah Jahan himself because he was the Emperor. 5,000 workers toiled every day for six years before the mosque was complete. It was built at a cost of Rs. 10 lakh. It had three gates. The eastern gate, known as the Shahi Darwaza was meant exclusively for the Emperor and his family who came from the Red Fort. The other two gates were meant for the others, including the common people. Continued to "Giving Life to the New City"